This is one of the reasons why I will not become vegetarian. That’s why I love lechon, lechon kawali and bagnet. This crispy roasted pork belly is essentially the same but easier to make. No deep frying involve- I don’t like deep-frying not because of any health reasons, in fact, I love deep-fried food but only when I don’t cook them myself because I hate throwing away too much oil after just one use and all the clean-up after. It’s very simple but not quick to make though ; you have to plan ahead so your family won’t have to wait a long time for their meal. First, you buy a slab of pork belly, with or without some bones in it, it doesn’t matter. You could ask your butcher to cut it in half so it’ll fit in a big pot or saucepan or steamer. Then. pre-cook it by either boiling or steaming, before roasting in the oven until the rind becomes golden and crispy. Yum. 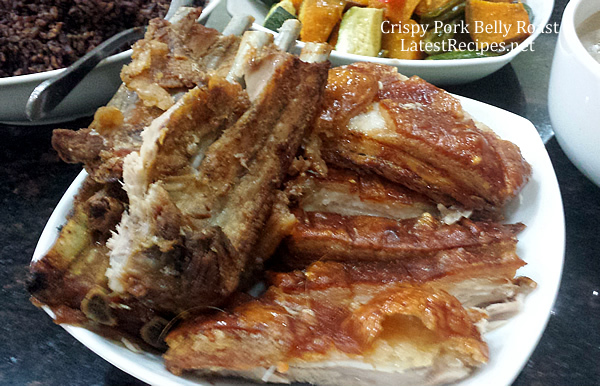 You could also try this recipe using roast pork belly…it’s so good, trust me. You could use your left-overs, too. You may choose either to boil or steam the pork belly..the outcome is the same. If boiling is your weapon of choice, simply put the pork belly in a big pot and fill it with water until it covers the pork belly. Add some salt about ¼ cup and bay leaf, if using. Bring it to a boil until pork is a just bit tender; it will still get cooked it the oven later. If steaming, boil water in the steamer and put pork belly on a steaming rack and put it on top, cover and make sure that the lid fits securely. Take pork off the water/steamer and pat rind thoroughly dry with kitchen paper and transfer pork in a big bowl, uncovered, and place in the refrigerator for two hours or overnight until the rind is dry. When ready to cook, bring pork to room temperature and preheat oven to 375F. Place pork skin-side up, on a chopping board, and using the tip of a sharp knife, stab the pork skin repeatedly until the surface is covered with holes, being careful not to go all the way through. Turn the pork belly over and score (make shallow cuts) on the rind . Pour about a tablespoon of oil over pork belly rub to spread it evenly, sprinkle some salt and pepper and massage well. Transfer pork to a wire rack over a roasting pan ( for catching the drippings). Roast for about 40 minutes; then set the oven temperature higher to about 450 and roast until the skin bubbles and turn golden and crispy. Remove pork from oven and allow to rest, uncovered, in a warm place for 15 minutes. To serve, cut into slices. Serve with some roast veggies and steamed rice.